Participants at a just-ended national consultative conference have bemoaned nepotism, unemployment, mismanagement of nation’s resources, and ‘winner takes all’ syndrome of politicians, among others, as serious sources of conflicts and threat to national peace. 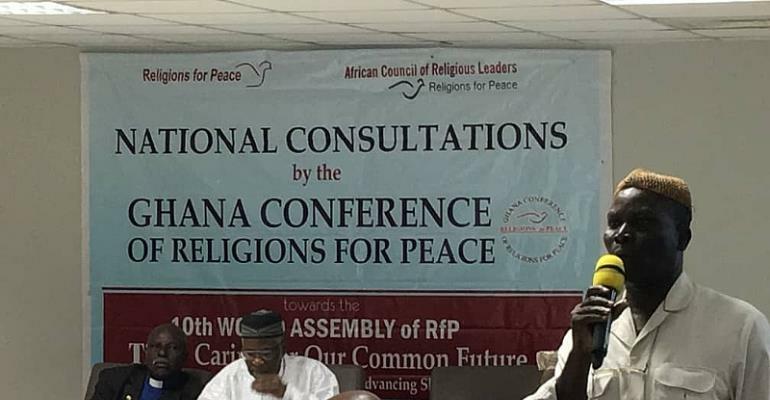 The national consultative conference was organized in Accra by the Ghana Conference of Religions for Peace (GCRP) under the general theme ‘Caring for Our Common Future – Advancing shared wellbeing’. The conference was one of the four main processes of the preparatory work towards the 10th World Assembly of Religions for Peace International due to be held in August in Lindau, Germany with support from the Federal Government of Germany and the Friends of Lindau. The processes of the preparatory work for the World Assembly include Project Work; Religious leaders’ regional meetings; Youth and Women Pre-assembly Consultations and National Inter-Religious Councils consultations. Participants discussed four other sub-themes, namely, ‘Preventing and Transforming Conflicts – including War and Terrorism’, Promoting Just and Harmonious Societies, Working for Sustainable and Integral Human Development, and Protecting the Earth. Participants were drawn from women, youth and religious leaders from member-organisations of the Ghana Conference of Religions for Peace (GCRP), the Commission of Human Rights and Administrative Justice (CHRAJ), EANFOWORLD for Sustainable Development, an Accra-based CSO, among others. The Ghana conference of Religions for Peace (GCRP) is the Ghana chapter of the World Conference on Religions for Peace (WCRP) now Religions for Peace (RfP) International. It is affiliated to the African Council of Religious Leaders – Religions for Peace (ACRL-RfP) which is the regional coordinator of twenty-seven (27) National Inter-Religious Councils (NIRCs) in Africa. ACRL-RfP is the largest and most representative multi-religious platform in Africa and the continental representation of Religions for Peace International. The member-organisations of the GCRP are Ghana Catholic Bishops' Conference (GCBC ), Christian Council of Ghana (CCG) , Federation of Muslim Councils of Ghana (FMC ), Office of the National Chief Imam (ONCI ), Ahmadiyya Muslim Mission, Ghana (AMMG ), Council of Independent Churches (CIC), Ghana Pentecostal and Charismatic Council (GPCC ), National Association of Christian and Charismatic Churches (NACCC , and the Council for African Instituted Churches (CAIC ). Under the chairmanship of Alhaji Mama Gado Mohammed of the Office of the National Chief Imam, the Executive Secretary of GCRP, Hajj Muhammad Kpakpo Addo gave the background and current preparations worldwide towards the 10th World Assembly. Hajj Kpakpo Addo, who was the facilitator of the conference, analysed the Commission Papers meant for the World Assembly that includes caring for our common future by advancing positive peace; caring for our common future through preventing and transforming conflict including wars and terrorism, among others. The participants were made to break into four groups to discuss the issues raised in the presentations, and returned to a plenary with recommendations on each of the sub-themes of the World Assembly. At plenary, it came to light that although some parts of the world are peaceful, other parts of the world lack peace due to one reason or the other. These include the unbridled fight for political power, lack of food and shelter in some parts of the world, unemployment, nepotism, mismanagement of nation’s resources, terrorism and so on. The members came out with recommendations for restoration of peace in all parts of the world especially in the poor and less privileged parts of the world. All the recommendations made would be presented to the ACRL-RfP as part of the amalgamated report of the Africa Region of RfP to the Assembly in Germany.